Linarinic acid, (−)-1,2,3,9-tetrahydropyrrolo[2,1-b]quinazoline-1-carboxylic acid (4a), was isolated from the ethanol extract of Linaria vulgaris Mill. In our previous study, a series of tetrahydropyrrolo[2,1-b]quinazoline derivatives 4b, 4c, 5a, 5b, 6a and 6b that were structurally related to 4a and evaluated as neuroprotective agents were synthesized. The aim of the present study was to investigate the novel features of these compounds. We examined their allergy-preventive effects using an in vivo assay system we developed previously, that monitors a decrease in blood flow in the tail vein of mice subjected to sensitization with hen egg-white lysozyme. 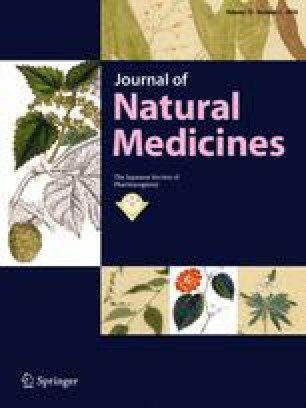 We observed that 4a and its three derivatives, amide (6a), ester (5a), bromine (4b), and alcohol substituent (6b), showed significant allergy-preventive activities. The study confirmed the allergy-preventive activity of tetrahydropyrrolo[2,1-b]quinazoline derivatives by comprehensively monitoring the specific blood flow decrease occurring in the induction phase of allergy. This finding may aid in the development of new agents for the treatment of allergic diseases such as atopic dermatitis, allergic asthma, and hay fever. The online version of this article ( https://doi.org/10.1007/s11418-018-1187-9) contains supplementary material, which is available to authorized users. We gratefully acknowledge the financial support from the National Natural Science Foundation of China (Grant 81502931), Fund for Career Development Support Plan for Young and Middle Aged Teachers in Shenyang Pharmaceutical University (Grant ZQN2015024), Student’s Platform for Innovation and Entrepreneurship Training Program (Grant 201710163000175), Program for Innovative Research Team of the Ministry of Education, and Program for Liaoning Innovative Research Team in University. The work was supported in part by a Grant-in-Aid for Scientific Research (C) from the Ministry of Education, Culture, Sports, Science, and Technology, Japan.